Area: 110,910 sq. km. (slightly larger than Tennessee). Major cities: Capital: Sofia 1.3 million. Others — Plovdiv 379,493; Varna 352,674. Terrain: Bulgaria is located in South Central Europe. The terrain is varied, containing large mountainous areas, fertile valleys, plains and a coastline along the Black Sea. Climate: Continental: mild summers and cold, snowy winters. Population (February 2011 census): 7,364,570. Population growth rate (February 2011 census): -0.7%. Ethnic groups (February 2011 census): Bulgarian 84.8%, Turkish 8.8%, Roma 4.9%, other 0.7% (including Macedonian, Armenian, Tatar), and unstated 0.8%. Religions (February 2011 census): Bulgarian Orthodox 76%, Muslim 10%, Roman Catholic 0.7%, Protestant 0.9%, others. Language: Bulgarian 85.2%, Turkish 9.1%, and Romani 4.2%. Health: Life expectancy (2009 est. ): male 69.48 years; female 76.91 years. Infant mortality rate (2009 est.) — 17.87 deaths/1,000 live births. Work force (2011 census): 3.3 million. By occupation (2007 est.) — agriculture 7.5%; industry 35.5%, services 57%. Constitution: Adopted July 12, 1991. Independence: 1908 (from the Ottoman Empire). Branches: Executive: president (chief of state), prime minister (head of government), Council of Ministers (cabinet). Legislative — unicameral National Assembly or Narodno Subranie — 240 seats. Members are elected through a mixed electoral system for 4-year terms. Judicial — three-tiered system. Administrative divisions: 28 provinces including the capital region of Sofia. Suffrage: Universal at 18 years of age. Political parties: Major political parties — Citizens for the European Development of Bulgaria (GERB); Bulgarian Socialist Party (BSP); Movement for Rights and Freedoms (MRF); Attack Political Party (ATAKA); Blue Coalition (formed by Union of Democratic Forces — UDF, Democrats for a Strong Bulgaria — DSB, and a few more center-right parties). Parties and leaders — Attack Political Party or ATAKA [Volen SIDEROV]; Blue Coalition (a coalition of center-right parties dominated by UDF and DSB); Bulgarian Socialist Party or BSP [Sergei STANISHEV]; Citizens for the European Development of Bulgaria or GERB [Boyko Borissov]; Coalition for Bulgaria or CfB (coalition of parties dominated by BSP) [Sergei STANISHEV]; Democrats for a Strong Bulgaria or DSB [Ivan KOSTOV]; Internal Macedonian Revolutionary Organization or IMRO [Krasimir KARAKACHANOV]; Movement for Rights and Freedoms or MRF [Ahmed DOGAN]; National Movement for Stability and Progress or NDSV [Hristina Hristova] (formerly National Movement Simeon II or NMS2); Order, Law, Justice or RZS [Yane YANEV]; Union of Democratic Forces or UDF [Martin DIMITROV]; Union of Free Democrats or UFD [Stefan SOFIYANSKI]. Results from the July 5, 2009 general election were as follows (voter turnout 60.20%; percentage of vote by party) — GERB 39.72%, BSP 17.70%, MRF 14.45%, ATAKA 9.36%, Blue Coalition 6.76%, RZS 4.13%, other 7.88%. As of November 2011, seat allocation was as follows — GERB 117, BSP 40, MRF 35, ATAKA 15, Blue Coalition 14, independent 19. Real GDP growth: 0.2% (2010); -5.0% (2009); 6.2% (2008); 6.4% (2007); 6.5% (2006); 6.2% (2005); 6.6% (2004); 4.3% (2003). Per capita GDP (2010): $6,522. Inflation rate: 4.4% (2010); 1.6% (2009); 7.2% (2008); 11.6% (2007), 6.1% (2006); 7.4% (2005); 4.0% (2004); 5.6% (2003). Unemployment rate: 9.2% (2010); 9.1% (2009); 6.3% (2008); 6.9% (2007); 9.1% (2006); 10.7% (2005); 12.2% (2004); 14.3% (2003). Natural resources: Bauxite, copper, lead, zinc, coal, and timber. Official exchange rate: Lev per $1 U.S. = 1.47 (2010); 1.36 (2009); 1.39 (2008); 1.33 (2007); 1.49 (2006); 1.66 (2005); 1.44 (2004). Bulgaria shares a border with Turkey and Greece to the south, Macedonia and Serbia to the west, Romania to the north, and the Black Sea to the east. The capital, Sofia, lies in the western region of the country. Ethnic groups include Bulgarian, Turkish, Roma, and others. The official language is Bulgarian. Ancient Thrace was partially located on the territory of modern Bulgaria, and Thracian culture provides a wealth of archeological sites within Bulgaria. In the second century A.D., the Bulgars came to Europe from their old homeland, the Kingdom of Balhara situated in the Mount Imeon area (present Hindu Kush in northern Afghanistan). The first Bulgarian state was established in 635 A.D., located along the north coast of the Black Sea. In 681 A.D. the first Bulgarian state on the territory of modern Bulgaria was founded. This state consisted of a mixture of Slav and Bulgar peoples. In 864, Bulgaria adopted Orthodox Christianity. The First Bulgarian Kingdom, considered to be Bulgaria's "Golden Age," emerged under Tsar Simeon I in 893-927. During this time, Bulgarian art and literature flourished. Followers of Saints Cyril and Methodius are believed to have developed the Cyrillic alphabet in Bulgaria in the early 10th century. In 1018, the Byzantine Empire conquered Bulgaria. In 1185 the Bulgarians broke free of Byzantine rule and established the Second Bulgarian Kingdom. A number of Bulgaria's famous monasteries were founded during this period. Following the 1242 Mongol invasion, this kingdom began losing territory to its neighbors. Ottoman expansion into the Balkan Peninsula eventually reached Bulgaria, and in 1396 Bulgaria became part of the Ottoman Empire. During the 5 centuries of Ottoman rule, most of Bulgaria's indigenous cultural centers were destroyed. Several Bulgarian uprisings were brutally suppressed and a great many people fled abroad. The April uprising of 1876, the Russo-Turkish War (1877-78), and the Treaty of San Stefano (March 3, 1878, the date of Bulgaria's national holiday), began Bulgaria's liberation from the Ottoman Empire, but complete independence was not recognized until 1908. During the first half of the 20th century, Bulgaria was marred by social and political unrest. Bulgaria participated in the First and Second Balkan Wars (1912 and 1913) and sided with the Central Powers, and later the Axis Powers, during the two World Wars. Although allied with Germany during World War II, Bulgaria never declared war on the Soviet Union and never sent troops abroad to fight under Nazi command. Near the end of World War II, Bulgaria changed sides to fight the German army all the way to Austria; 30,000 Bulgarian troops were killed. Bulgaria had a mixed record during World War II, when it was allied with Nazi Germany under a March 1941 agreement. The Law for the Protection of the Nation, enacted in January 1941, divested Jews of property, livelihood, civil rights, and personal security. Despite a February 1943 agreement requiring Bulgaria to transfer Bulgaria's Jews to Nazi extermination camps in Poland, Bulgaria did not actually deport any Bulgarian Jews or Roma to Nazi concentration camps. Under that agreement, however, Bulgarian forces transferred approximately 11,000 Jews from Bulgarian-occupied territory (Thrace and Macedonia) to Nazi concentration camps. In June 1943 the government "re-settled" Sofia's 25,000 Jews to rural areas. Tsar Boris — supported by the parliament (especially its prominent Deputy Speaker, Dimitar Peshev), the Orthodox Church, and the general public — aided the Jewish community and helped its 50,000 members survive the war, despite harsh conditions. The Bulgarian Jews remained safe, and when they were permitted to emigrate to Israel after the war, most of them did. King Simeon II assumed control of the throne in 1943 at the age of six following the death of his father Boris III. With the entry of Soviet troops into Bulgaria in September 1944 and the defeat of the Axis Powers in World War II, communism emerged as the dominant political force within Bulgaria. Simeon, who later returned and served as Prime Minister, was forced into exile in 1946 and resided primarily in Madrid, Spain. 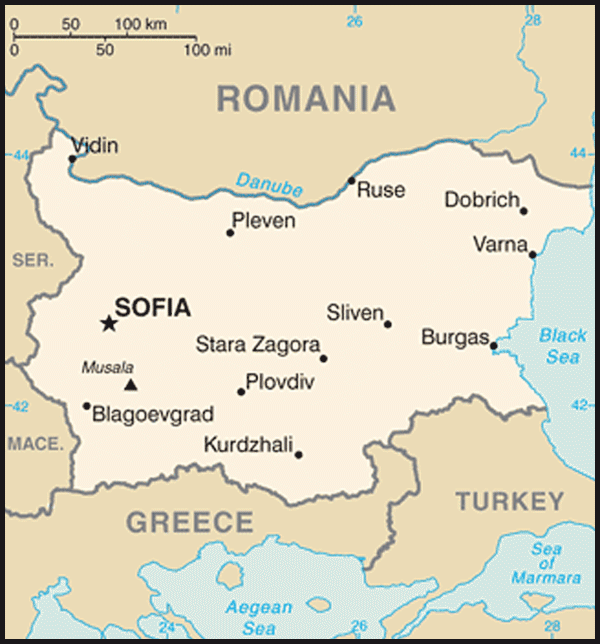 By 1946, Bulgaria had become a satellite of the Soviet Union, remaining so throughout the Cold War period. Todor Zhivkov, the head of the Bulgarian Communist Party, ruled the country for much of this period. During his 27 years as leader of Bulgaria, democratic opposition was crushed; agriculture was collectivized and industry was nationalized; and the Bulgarian Orthodox Church fell under the control of the state. In 1989, Zhivkov was removed from power, and democratic change began. The first multi-party elections since World War II were held in 1990. The ruling communist party changed its name to the Bulgarian Socialist Party and won the June 1990 elections. Following a period of social unrest and passage of a new constitution, the first fully democratic parliamentary elections were held in 1991 in which the Union of Democratic Forces won. The first direct presidential elections were held the next year. As Bulgaria emerged from the throes of communism, it experienced a period of social and economic turmoil that culminated in a severe economic and financial crisis in late 1996-early 1997. With the help of the international community, former Prime Minister Ivan Kostov initiated a series of reforms in 1997 that helped stabilize the country's economy and put Bulgaria on the Euro-Atlantic path. Elections in 2001 ushered in a new government and president. In July 2001, Bulgaria's ex-king Simeon Saxe-Coburg-Gotha became the first former monarch in post-communist Eastern Europe to become Prime Minister. His government continued to pursue Euro-Atlantic integration, democratic reform, and development of a market economy. Bulgaria became a member of the North Atlantic Treaty Organization on March 29, 2004, and a member of the European Union (EU) on January 1, 2007. Following June 2005 general elections, Sergei Stanishev of the Bulgarian Socialist Party became the new Prime Minister of a coalition government on August 16, 2005. In October 2006, Georgi Parvanov, the former leader of the Bulgarian Socialist Party, became the first Bulgarian president to win re-election. Despite his limited constitutional powers, President Parvanov played an important role in helping to ensure a consistent, pro-Western foreign policy. The Stanishev government continued Bulgaria's integration with the Euro-Atlantic world and its close partnership with the United States. Bulgaria has attracted large amounts of American and European investment, and is an active partner in coalition operations in Afghanistan as well as in UN-led peacekeeping operations in the Balkans. In the July 2009 general elections, Bulgarian voters punished the Socialist-led government for corruption scandals and frozen EU funds. Citizens for the European Development of Bulgaria (GERB) took 116 of 240 seats in parliament, and its leader (and former Sofia mayor) Boyko Borissov became the Prime Minister. Borissov formed a minority government supported by the Blue Coalition, ATAKA, and Order, Law, Justice (RZS), but in the course of its second year in office, these parties gradually withdrew their support for GERB. The government's priorities include: promoting economic stability, unblocking the frozen EU funds, and fighting corruption. 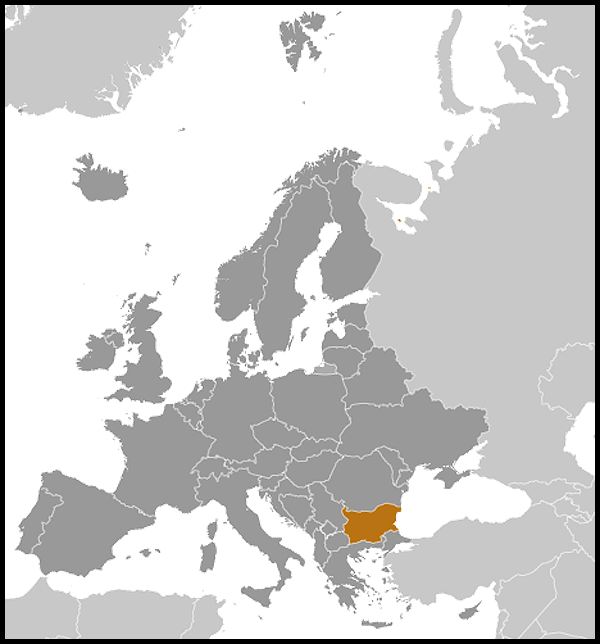 Bulgaria is a parliamentary republic. The unicameral National Assembly, or Narodno Subranie, consists of 240 deputies who are elected for 4-year terms through a mixed electoral system: 209 members of parliament (MPs) elected according to the classic proportional representation system (voters vote for fixed, rank-ordered party lists for each of the 31 electoral districts, with a different list for each district), and 31 majority MPs elected individually under the majority representation system in each and every district (the winning candidate receives a plurality of the votes in the region). Parliament selects and dismisses government ministers, including the prime minister, exercises control over the government, and sanctions deployment of troops abroad. It is responsible for enactment of laws, approval of the budget, scheduling of presidential elections, declaration of war, and ratification of international treaties and agreements. A 1-month official campaign period precedes general elections. The voting age is 18. Preliminary results are available within hours of poll closings. Parties and coalitions must win a minimum 4% of the national vote to enter parliament. Seats are then allocated to the parties in proportion to the distribution of votes in their respective electoral districts. Votes belonging to parties not passing the 4% threshold are distributed to other parties using the method of the smallest remainder. The lists of newly elected members of parliament are announced 7 days after the elections. The president must convene the new parliament within 1 month after the elections, and calls upon parties, coalitions, or political groups to nominate a prime minister and form a government. If the three largest parties, coalitions, or political groups fail to nominate a prime minister, the president can dissolve parliament and schedule new elections. In recent years, it has taken approximately a month for the new government to form. In the general election held in Bulgaria July 5, 2009, turnout was 60.20%. Results were as follows: GERB 39.7%, BSP 17.7%, MRF 14.4%, ATAKA 9.4%, Blue Coalition 6.8%, RZS 4.1%, other 7.9%; seats by party were GERB 116, BSP 40, MRF 38, ATAKA 21, Blue Coalition 15, RZS 10. Results of the June 7, 2009 European Parliament elections were GERB 24.36%, 5 seats; BSP 18.5%, 4 seats; DPS 14.14%, 3 seats; ATAKA 11.96%, 2 seats; NDSV 7.96%, 2 seats; Blue Coalition (SDS-DSB and other right-wing parties) 7.95%, 1 seat (turnout: 37.49%). The president of Bulgaria is directly elected for a 5-year term with the right to one re-election. The president serves as the head of state and commander in chief of the armed forces. The president is the head of the Consultative Council for National Security and, while unable to initiate legislation, can return a bill for further debate. Parliament can overturn the president's veto with a simple majority vote. Bulgarian Socialist Party candidate Georgi Parvanov won the November 2001 presidential election and was re-elected in October 2006 as an independent candidate in a runoff against Volen Siderov, the leader of extreme nationalist ATAKA Party. Presidential and local elections were held in October 2011. Turnout for the first round was 51.8%; the top three vote winners were Rosen Plevneliev (GERB) 40.11%, Ivailo Kalfin (BSP) 29%, and Meglena Kuneva (independent) 14%. Plevneliev defeated Kalfin 52.6% to 47.4% in the runoff and took office in January 2012. The prime minister is head of the Council of Ministers, which is the primary component of the executive branch. In addition to the prime minister and deputy prime ministers, the Council is composed of ministers who head the various agencies within the government and usually come from the majority/ruling party or from a member party of the ruling coalition in parliament. The Council is responsible for carrying out state policy, managing the state budget and maintaining law and order. The Council must resign if the National Assembly passes a vote of no confidence in the Council or prime minister. The Bulgarian judicial system became an independent branch of the government following passage of the 1991 constitution. Reform within this branch has been slow, with political influence, widespread corruption, and long delays continuously plaguing the system. In 1994, the National Assembly passed the Judicial System Act to further delineate the role of the judiciary. In 2003, Bulgaria adopted amendments to the constitution, which aimed to improve the effectiveness of the judicial system by limiting magistrates' irremovability and immunity against criminal prosecution. Additional amendments to the constitution in 2006 and 2007 further increased oversight of the judicial system by the legislative branch. They introduced the Supreme Judicial Council as a permanently operating supervisory body, as well as an Inspectorate responsible for overseeing the performance of the judicial system as a whole and its individual members. The prosecution service was given absolute authority over all investigations, and the police received a mandate to investigate 95% of all crimes, which reduced the role of the investigative service. The trial, appellate, and cassation (highest appellate) courts comprise the three tiers of the judicial system. Military courts (at trial and appeal level) handle cases involving military and Ministry of Interior personnel. Administrative courts, effective since March 2007, specialize in reviewing appeals of government acts. The Supreme Administrative Court and the Supreme Court of Cassation are the highest courts of appeal and determine the application of all laws. The Supreme Judicial Council (SJC) is composed of 25 members serving 5-year terms. Those who serve on the council are experienced legal professionals and are either appointed by the National Assembly, selected by the judicial system, or serve on the SJC as a result of their position in government. The SJC manages the judiciary and is responsible for appointing judges. In 2007 parliament revised the Judicial System Act to make it compliant with the latest constitutional amendments, which provided for the establishment of the Inspectorate with the Supreme Judicial Council: a standing body with 11 members who investigate complaints of magistrates' misconduct, with no right to rule on the substance of judicial acts. The Constitutional Court, which is separate from the rest of the judiciary, interprets the constitution and constitutionality of laws and treaties. Its 12 justices serve 9-year terms and are selected by the president, the National Assembly, and the Supreme Courts. Bulgaria maintains an embassy (http://www.webhousing.biz/~bulgaria/) in the United States at 1621 22nd Street, NW, Washington DC 20008 (tel. 202-387-0174; fax: 202-234-7973). Bulgaria's economy contracted dramatically after 1989 with the collapse of the COMECON system and the loss of the Soviet market, to which the Bulgarian economy had been closely tied. The standard of living fell by about 40%. In addition, UN sanctions against Yugoslavia and Iraq took a heavy toll on the Bulgarian economy. The first signs of recovery emerged when GDP grew in 1994 for the first time since 1988, by 1.4% and then by 2.5% in 1995. Inflation, which surged in 1994 to 122%, fell to 32.9% in 1995. During 1996, however, the economy collapsed due to shortsighted economic reforms and an unstable and de-capitalized banking system. 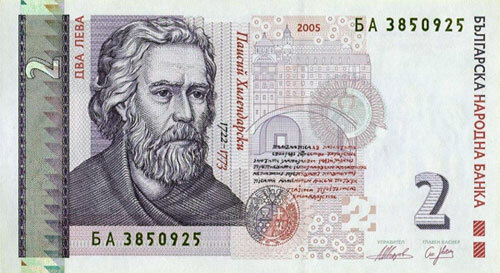 Under the leadership of former Prime Minister Ivan Kostov (UDF), who came to power in 1997, an ambitious set of reforms was launched, including introduction of a currency board regime, bringing growth and stability to the Bulgarian economy. The currency board contained inflationary pressures and the three-digit inflation in 1997 was cut to only 1% in 1998. Following declines in GDP in both 1996 and 1997, the Bulgarian Government delivered strong, steady GDP growth in real terms in recent years. Prime Minister Simeon Saxe-Coburg's economic team of young, Western-educated financiers continued to implement measures that helped sustain stable economic growth and curb unemployment. Measures introduced by the government were targeted at reducing corporate and individual taxes, curtailing corruption, and attracting foreign investment. The government also restructured the country's foreign debt, revived the local stock market, and moved ahead with long-delayed privatization of some major state monopolies. As a result of this progress, in October 2002 the European Commission declared Bulgaria had a "functioning market economy." Successive governments continued these reforms, and in 2007 the country joined the European Union. According to the World Bank, in 2006 Bulgaria attracted the highest levels of foreign direct investment, as a share of GDP, among Eastern European countries. In early 2007, to attract additional foreign investment, the Bulgarian Government lowered corporate tax rates to 10%, reportedly the lowest rate in Europe. A flat-tax rate of 10% for personal income, in place as of January 1, 2008, has helped to bring down domestic labor costs and reduce the share of the "gray" economy. In response to local governments' demand for financial independence in 2006, parliament passed fiscal decentralization of municipalities, granting them authority over collection and administration of some taxes, thus further enhancing local economic stability. The 2007-2009 global financial and economic crisis erased many of the gains attributed to conservative fiscal policies and tax reforms. After 10 years of steady growth, Bulgaria's economy fell into recession in the fourth quarter of 2008, causing an increase in both unemployment and household debt. After years of relatively low inflation, domestic prices, particularly of food and energy, increased in 2010. The government was slow implementing some of its planned anti-crisis measures, and resorted to tapping into the fiscal reserve to tackle short-term spending problems. The government also committed itself to strengthening control over EU funds and fighting organized crime and corruption. The global financial crisis significantly reduced the flow of new investments, which previously supported strong economic growth. Domestic consumption remained weak, and in 2011 export growth recovery slowed, reflecting signs of recession in Bulgaria's major EU trading partners. Faced with tough budget decisions, the government continues to maintain fiscal discipline and a policy of budget deficit reduction by planning a deficit of 1.3% of GDP in 2012. In contrast to some Euro-zone states, Bulgaria's public finances are not overwhelmed by huge international debt, and its level of government debt (12% as of November 2011) remains one of the lowest within the EU. Bulgaria became a member of NATO on March 29, 2004. Bulgaria's military is currently undergoing an ambitious restructuring program which aims to bring the army up to NATO standards, modernize equipment, and bring about full integration of the civilian and armed components. In 2008, Bulgaria made the transition to an all-volunteer force. Through FY 2010, the U.S. Government has provided approximately $143 million in foreign military financing assistance to support training and procurement of military equipment. Bulgaria has had over 700 troops serving abroad in support of NATO, EU, and UN missions. It currently has around 600 troops in Afghanistan and has maintained small contingents in Bosnia and Herzegovina and Kosovo. It has several military observers serving in support of United Nations missions in Liberia and Kosovo, as well as the EU's Operation Atalanta to fight piracy off the coast of Somalia. Bulgaria deployed a frigate to help enforce the UN arms embargo against Libya in 2011. There are three Bulgarian bases identified as "joint-use facilities" (meaning the U.S. has the right to station troops and conduct training in them) in the U.S.-Bulgarian Defense Cooperation Agreement (DCA) signed April 28, 2006 by Secretary of State Condoleezza Rice: Novo Selo Training Area (including the Aytos Storage Facility), Bezmer Air Base, and Graf Ignatievo Air Base. Bulgaria became a member of the North Atlantic Treaty Organization on March 29, 2004, and a member of the European Union on January 1, 2007. It is a member of the United Nations, and in 2002-2003 served a 2-year term as a nonpermanent member on the UN Security Council. Bulgaria served as Chair-In-Office of the Organization for Security and Cooperation in Europe (OSCE) in 2004. The country joined the World Trade Organization in 1996. In July 1998, it became a full member of the Central European Free Trade Agreement (CEFTA), which called for the reduction of tariffs by 2002 on most industrial and agricultural goods traded between CEFTA countries. Bulgaria has initialed free trade agreements with Turkey, Macedonia, Croatia, Lithuania, Estonia, Israel, Albania, and Latvia. On September 22, 2009, UNESCO's Executive Board nominated Bulgarian diplomat Irina Bokova to become its next Director General; she took office in November 2009. Bulgaria's relationship with its neighbors has generally been good. The country has proven to be a constructive force in the region and has played an important role in promoting regional security. Pursuing its initiative as a partner in the South-East European regional cooperation, Bulgaria held the chairmanship-in-office of the South-East European Cooperation Process (SEECP) for the period May 2007-May 2008. At the end of December 2011, Bulgaria assumed the remainder of Hungary's term (through 2013) on the UN Economic and Social Council based on an internal agreement between the two countries. The year 2003 marked the 100th anniversary of diplomatic relations between the United States and Bulgaria. U.S.-Bulgarian relations were severed in 1950 but were restored a decade later. Bilateral relations between the two nations improved dramatically after the fall of communism. The United States moved quickly to encourage development of multi-party democracy and a market economy. The U.S. signed a Bilateral Investment Treaty in 1994 and gave Bulgaria most-favored-nation trade status in October 1996. In 1989, the U.S. Congress passed the Support for East European Democracies Act (SEED), authorizing financial support to facilitate development of democratic institutions, political pluralism, and free market economies in the Balkan region. Bulgaria graduated from the SEED program in 2007 following its EU accession, having received over $600 million in SEED assistance since 1990. The U.S.-Bulgarian Defense Cooperation Agreement gives the United States military access to and shared use of several Bulgarian military facilities. The access facilitates joint training between the U.S. military and the Bulgarian and Romanian militaries. In January 2009 a treaty on avoidance of double taxation came into effect. American citizens traveling on a U.S. passport for business or tourism purposes can enter and stay in Bulgaria for up to 90 days in a 6-month period without requiring issuance of a visa. Bulgaria hosts the only fully American university in the region, the American University of Bulgaria in Blagoevgrad, established in 1991, drawing students from throughout southeast Europe and beyond. As of 2007, the American University of Bulgaria had over 1,000 students. In June 2007, President George W. Bush visited Sofia following the first visit of a U.S. President, Bill Clinton, in 1999. Legal Attache: Timothy Langan, Jr.